Romain Grosjean (born April 17, 1986 in Geneva, Switzerland) is a racing driver, who holds dual nationality from France and Switzerland, but competes under a French racing licence. He was the 2007 Formula Three Euroseries drivers' champion and the inaugural GP2 Asia Series champion and drove in Formula One in 2009. He is currently the reigning GP2 Asia Series and GP2 Series champion and holds the unique achievements of being the only two-time GP2 Asia champion and the only driver to hold both the GP2 Asia series and main GP2 series titles simultaneously. 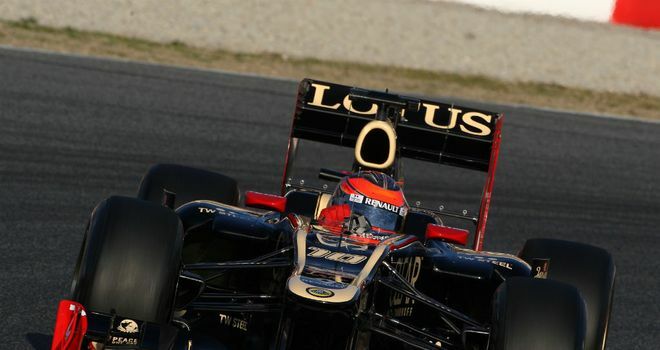 In 2012, Grosjean will return to a full-time Formula One drive with the Lotus F1 Team, alongside Kimi Räikkönen. Romain will give Kimi a hard time. He will probably be faster than Kimi in the first couple of races. Will be interesting. not a huge grosjean fan but he deserves credit for his drive in qualifying today. definately surprised me! what an amazing run... way to go Romain! Where the hell did he come from, excellent qualy, just dont overtake the mclarens in the first corner and I might just like the guy. Just saw him get out of the car to talk to DC, with that big smile on his face, and I just realized I've become quite a fan of him. The Renault and Alonso did not flatter him, but he's really shown to be a very good driver, and his personality is just great! Arguing semantics: the lowest form of internet discussions. Thought as Grosjean keeps growing and growing as a racer and a driver this thread deserved a bumpity bump bump. If he can come to grips with finishing races (which imho helps a tad in F1) then he shows a decent amount of promise. Personally he is growing on me race by race. I just wish we had a better picture of the relevant pace of the Lotus right now as it's hard to gauge with a rusty KR in the other car. If he is Swiss (and I accept he is), why does he drive under the French flag? Motorsport is banned in Switzerland, the FIA requires your super license to be issued by a country. Romains has been issued by the French. The Swiss banned motorsport after a huge accident in the 1955 after a huge accident at Le mans killing 80 spectators. Cheers. Ironically it's quite a French-sounding name. RG is an incredible talent. So impressive how he worried about getting his car safely off the track, after such bad luck! Shows great awareness and self-control. Always smiling too, good at interviews. Due for a win soon. Early in season Romain said he learnt a lot from Kimi's traces, saying how fast KR was. Great progress. I was so upset when his car slowed to a halt, he could have won today. He is the most exciting driver to enter Formula One since Lewis Hamilton in my opinion, so naturally quick and a brilliant overtaker. He's been clumsy at times, but is definitely learning from his mistakes and will bag that first win hopefully very soon. Exciting times in F1 right now. today he has shown that his race pace is as good as kimi..i still feels he will get a win this year.. The whole Enstone family would like to offer hearty congratulations to Romain, who took a rare break from Formula 1 commitments yesterday; returning home to France to celebrate a very special occasion… his wedding! So now we know why Romain has been smiling all year. Now a proper fan of his guy, the win coming soon (I hope). Jenson Button & Williams F1 Team supporter! I never bought the "spacial awareness issues" being touted on these forums in relation to Grossjean. I still find it amazing that those who watch F1 can imagine a situation where a driver manages to make it to F1 with "spacial awareness issues". It was simply rookie-mistakes that he already seems to be addressing. I will be keeping an eye on this guy, because I can see real potential. I'm starting to really like the look of Grosjean. I didn't judge him on his initail F1 foray, and had a feeling he'd give Raikkonen a hard time, but he's looking very impressive to me. Fast and extremely committed. OK so his car seems a little magnetic but that can be sorted out. I'm really interested to see where his F1 career goes from here. Solid job from RG, great pace. I do wonder, how good this car really is though (i.e. how would it fare in another drivers hands?). For how long is Grosjean contracted to Lotus, might he be a potential for Massa's seat? Great qual, first front row in F1. Very happy and I will be pulling for him tomorrow! The Lotus's always have very good starts so I am hoping he beats Hamilton off the line! Well done Grosjean! Lets hope he has a trouble free opening lap! I hope all goes well for him in tomorrows race, a podium would be great! Well, he's not Swiss, he's French.... Or did you joke around, and it went over my head? Well, he is Swiss. Born in Geneva and lived there for a huge part of his life. I don't think he even holds dual Swiss/French citizenship. My guess is he chose to race under French flag because he was (is?) part of Renault it was more marketable.